Posts tagged "girls last tour"
The brothers take their first viewer request and follow melancholic moe-blobs in the snow in Girls’ Last Tour. 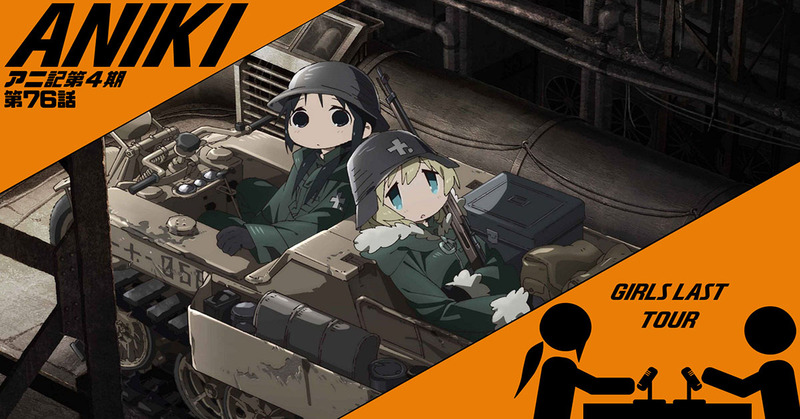 Set in an indeterminate far dystopian future, Girls’ Last Tour showcases a war-torn landscape, a dead fish, a weird cat, a kettenkrad, and two naive survivors as they try to stay alive and find other traces of living people. A deeply introspective experience, it is the first nightmare slice-of-life the Aniki brothers have seen. Also featuring: Dragonalia Lost and Overlord.